So it turns out there's a lot of things that don't make sense to me about Season 7. 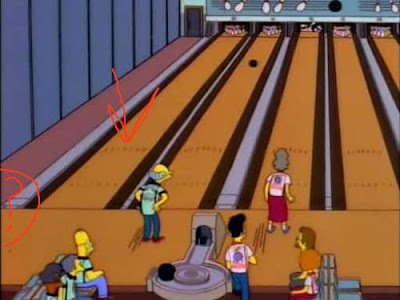 Take, for example, the episode 'Team Homer', in which Homer joins a bowling league and winds up saddled with Mr. Burns as a teammate. Hilarity ensues. 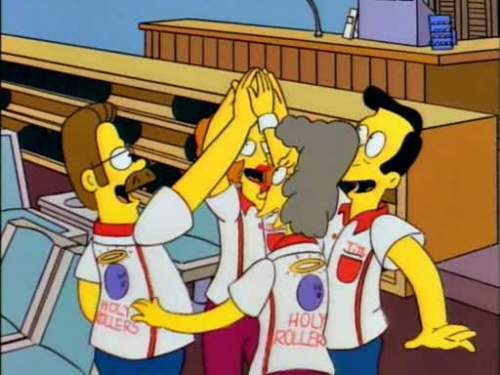 Their main competition in this league are a team called the 'Holy Rollers', who are really, really good at bowling. So good that god himself intervenes to ensure that Ned gets a strike (and Homer is shocked by the ball return). Naturally the two teams square off against one another in the final match of the season (although I'm not sure how - Burns causes to them to lose at least one game in what should be the elimination rounds...) and it all comes down to Mr. Burns, who, with his last two balls must knock over at least two pins to win the game. We see them bowl four strikes in the time it takes Burns to throw a single gutterball. In this kind of a game the combined scores of both teams (the maximum is 1200) are compared to decide the winner. But with Burns being completely useless, the de facto maximum score that the 'Pin Pals' could have had at the end of the game was 902 - and that would require the rest of the team to have bowled three perfect games, which is a statistical impossibility - and surely would have been mentioned had it happened. Even if that was the case, the Holy Rollers would have had to bowled an average score of 233 - a great score by most standards, but not what we're told to expect from them. According to the show's logic, had Otto been on the team instead of Burns, the Pin Pals would have won the championship by a margin of at least 200 points - if the Holy Rollers could be thumped that badly, what threat were they supposed to have posed in the first place? Also, where is this lane's ball return?